Hmmm, ich sagte ja: hier geht es zur Sache! Die UnstampaBelles haben den Monat des Recycling ausgerufen – ich habe für diese Karte das gestickte Motiv recycled, das ich einmal auf einer Weihnachtskarte einer Freundin aus Yorkshire bekommen habe. Von dort kommt weiterhin Nachschub – schon im vergangenen Jahr hatte ich ein Motiv wiederverwertet. 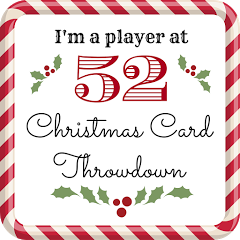 Mmmhh… it’s just like I said yesterday: cards will keep coming. 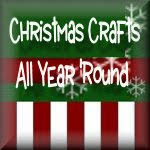 This month is all about recycling for the UnstampaBelles – the Santa image is the recycled part. I received it some years ago from a friend in Yorkshire. And she keeps them coming – I had already recycled one last year. Great ryclycled roject … how clever! Ahhh Cute! Good job recycling! A great way to repurpose that lovely cross stitch image. Thanks for joining our challenge at Unstampabelles. This is so cute! 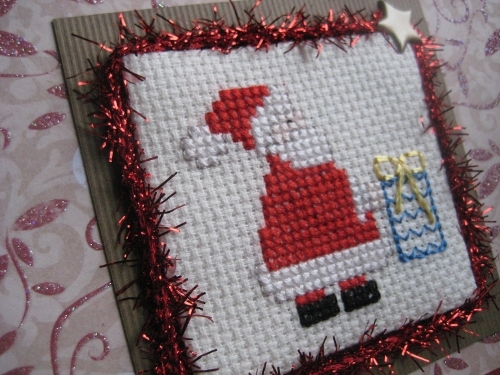 I love that x-stiched Santa, perfect for recycling! Thanks for stopping by my blog! 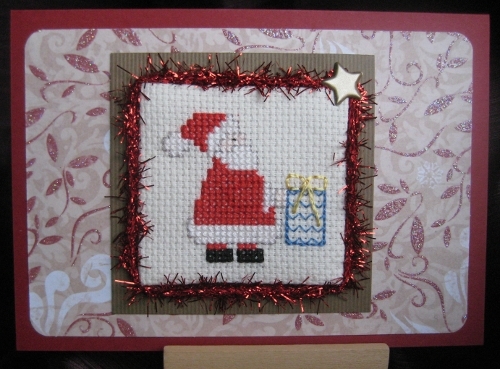 very pretty card – love added feature of the cross stitch 😉 Thanks for joining in the recycling challenge at UnstampaBelles. Such a cool details with the stitching. Super creative!! Great work and thanks for joining us over at the Unstampabelles Challenge! !